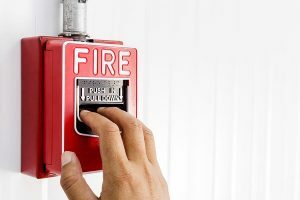 AJ Taylor install fire detection systems and fire alarms in both large and small properties throughout Sussex and Surrey including all surrounding areas. If you are interested in fire alarms in Sussex, get in touch. We offer a wide range of equipment and detectors for all possible fire detection and alarm needs such as Smoke Detectors, Heat Detectors, Fixed Temperature Heat Detectors, Manual Call Points and Door Retainers. We also specialise in installation and maintenance of emergency lighting carried out to a high professional standard. Our installations can be remotely monitored and if required can be configured to instantly alert either the fire brigade or designated key holders in the event of an alarm being activated. There is a guarantee period of 6 years commencing from completion of any work, which means that any installation work failing to comply with the relevant British standards and codes of practice will be rectified. We offer a free no obligation survey and estimate of your needs, allowing us to quote for a tailored solution suited to each and every client.